Moring's Why Don't You Count? Book reviews of easy English books in easy English. And my writings in easy English tell you my feeling or opinions. I also want to introduce my favorite gadgets. VOA Special English for listening. I had sticked to counting how many words I had read. Finally it got hot yesterday and today. The highest temperature in a day was 32C on yesterday and 33C on today in Tokyo. But humidity was very low. I thought it is like California. We must get stamina on hot day. Then I ate grilled eel for lunch (see picture). 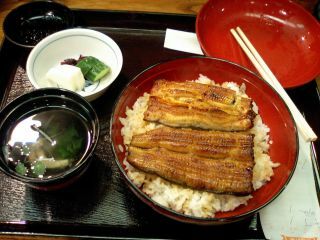 Grilled eel on rice is popular and traditional meal on hot days in Japan. And today is cow day. A cow, or oxen, is one of animal we count year, month, day, and hour by the old way. This tradition had come from China long time ago. There are twelve animals that we use for it. But I don't know what is it called in English. There must be many kinds of Cow days. And people eat eel at one kind of Cow day in Japan. Then many restaurants prepared the grilled eel on rice today, even convenience stores sold a lot of grilled eel on rice lunch boxes. I feel like I can smell the good smell of burned soy-souce and sugar from your photo. Hi Julie. Thanks for leaving your comment. And I'm sorrry I didn't reply quickly. I ate the eel on rice that friday and the day before this day. The photo is expensive one. I'd been at my parents' house in Osaka and visit Kyoto. I'll report for my visiting Kyoto soon. Click above link of Blog-mura when you liked my writing.